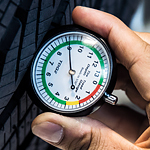 Inspect your tires for low treads on one or more of your tires. Uneven tire tread can indicate there is a bigger problem going on with your vehicle that needs to be addressed. If the treads are low on all four tires, then it's time for a new set. Cracks in your tires shows that the material your tires are made out of are wearing out. This could be a big safety concern. Stop down to Parks Fiat of Wesley Chapel if you would like our help inspecting your vehicle to see if new tires are in your future. We'll help you find the right brand and size for your vehicle.